This article describes how virtual reality and augmented reality are already being used to implement primary and secondary education. Did you know that an Egyptian temple can be recreated in a 3D environment and that it is possible to walk through it as a true surround environment without leaving the classroom? Or view on your screen a complete Roman house, with all its rooms, and move its figure to see all its views; Watching oneself attired as a Roman centurion, while all the drapery accompanies your movements; moving to anywhere in the world and feel its temperature and odors; stroll along the ocean floor surrounded by cephalopods or watching a complete heart beating in the middle of a classroom... These are just some of the possibilities that technologies offer to the world of education. It has already ceased to be science fiction and is entirely feasible if you have the appropriate devices. Virtual reality, although initially is highly targeted to games (it was born for the video game industry), it can have a big space in education and training, as it is very immersive (it gives way to immersive learning). It allows you to enter a 360º video shot or created 3D immersive environment. "For teaching languages, for example, it is already shown that it is very useful. Progress is being made in environments to get to be collaborative, and then we will be able to get connected to many learners in the same virtual space", David says. inMediaStudio has created the Immersive Worlds project, which implements the method of immersive learning. Here, students can immerse themselves in a seabed environment to learn marine biology. It works with a tablet in which the teacher activates scenarios that students will see through virtual reality glasses. "There are no books, all content is exposed otherwise. Using a tablet, the teacher knows who are seeing what appears on the screen. You can ask them what animals are vertebrates and invertebrates, and children should point them by looking at them. At the end of the activity, the teacher can know who has seen it and who has not, who is mistaken and who is not". "We have several virtual reality experiences for education –David explains to us. This is another solution for education that we love, also with a pair of virtual reality; this time are the Oculus Rift. Here we see the temple of Luxor to study it in a more immersive way. We propose it as an evaluation in which the student must enter the monument and identify its architectural features in situ. All information regarding student performance is drawn and the teacher can see it in real time”. "Then we have this prototype, that we call 'Tele Transport Booth'", David says. "In addition to traveling to different virtual reality scenarios, it emits heat or cold, so that each experience gets to be very realistic. Also it emits odors: There is an experience in a buffet where you are being served a coffee and you can smell it". Although it is not being used in special education, David believes that there are many possibilities to go exploring: "For example, the whole issue of virtual reality glasses -says David-, I see it clear in children who have, for example, attention deficit or hyperactivity; you put them the glasses and they get concentrated, they get excited and they absorb the content. Experts will say: 'Are kids going to spend all day in class with glasses on?' No, but maybe for issues, problems, etc. or specific or certain concepts or processes, that's beneficial, or else for children with difficulties in any subject. The other day, in a school, there was a hyperactivity disordered kid, and he had some difficulties to learn the multiplication table. He himself had devised a system to concentrate and learn. If you work content and offer a solution based on this way of 'getting' into the content, also knowing that all kids love these devices, in the end the child would learn the multiplication table without becoming an added problem for him". We have thousands of 3D objects that give a fairly large value to training. 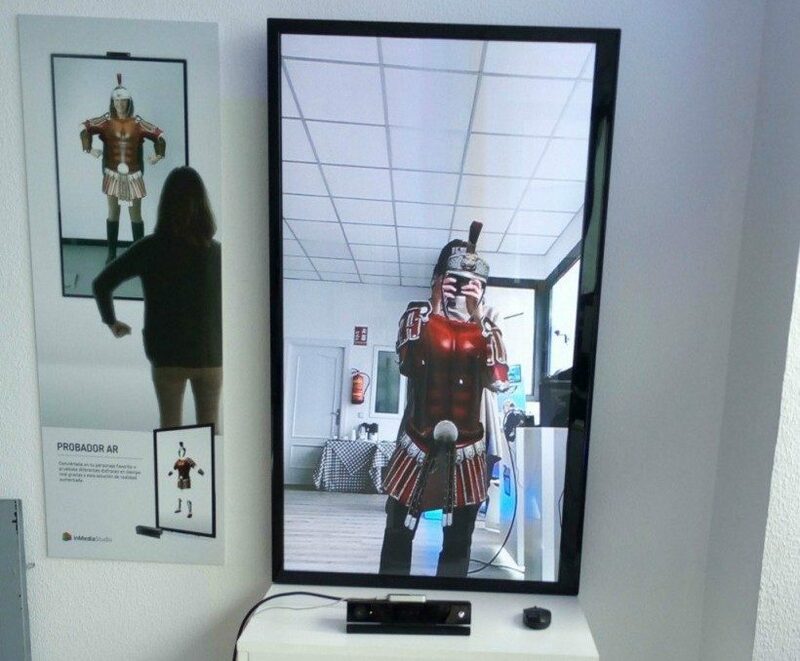 We display a 3D object and we have a device called Leap Motion, which uses the Motion Capture technology to recognize the hand movement and to reposition the objects we see. It can be used in an exhibition, during a classroom... For example, this is a Roman house; you're explaining how Rome and a Roman house were. It has didactic elements. When you point a room, as the store, the system indicates where you are. It is another way to display content using technology and leveraging the strength of images". inMediaStudio has developed the Aula Virtual Santillana product. "This is a platform for teachers and students to access an incloud environment where they can send, create and send homework, view statistics, studying digital books... The use of these platforms is beginning to show a very important transformation between how a class session was managed before and how it is done now". "There are innovations through an NFC reader and with any 'card' filled with the content you need, that help us join environments of digital content with physical environments that can be sold, and not just online, but in any bookstore, in malls, etc". "We work with technology -says David-, but we do not get tired of saying that content is king; if you have not good content, even if you use the latest technology, learning will not be possible. We have always been dedicated to transforming the contents of others to let them sell it to the market. Although we do not have experts to create content, we do have professionals to move that content to a digital environment”. "In Santillana we have developed much of its strategy of content in digital format during the last five years. We have created a production tool that has more than 200,000 items, over 2000 books and that manages all this content to more than 24 countries that are accessing the tool. We have collaborated in the production of books, as well as in the activities and resources on it". "Digital books are meant to be consumed in digital devices (tablets, computers, whiteboards...). The structure is designed for usability to be adequate in such devices. Now a student can read and while reading, he/she can do an activity or view a video or analyze a scheme, all without leaving the digital book". "In education, a section that I think is more interesting is to know what content is meeting the educational objectives to be met, because when we edited paper, we only knew what teachers, students told us, but when digitizing the content, if we endow of 'traceability', we will know what content is most viewed, what exercises are done, which are not, which are repeated, which are not made, what content are viewed... I mean, it gives us a timely real and immediate feedback", says David. "All that the student does is leaving a mark: The teacher knows what the student is seeing; editors can see what works or not in content; that information is very valuable to publishers and companies that generate the content, because it allows more and more content to be presented to our students to meet that huge demand for which they are made: Teaching, generating knowledge". "This is an arduous task", David says. "People love technology; the world of tablets, smart phones, the SmartTV, virtual reality devices, digital books that allows you to interact... It is very attractive, but introducing it in the educational system and adapting it is quite complicated, because there are still people who have difficulty understanding that it is a new way to communicate, to teach, to learn... Most of the people are accustomed to a traditional way of teaching; a change is needed, but above all, training is needed, because with it, the use of all these devices will come to better meet the needs of education that we have right now. All this will change, but accessing is a little bit difficult and precisely, the most innovative institutions are the ones that are now beginning to risk a little and to work without the paper content to that we were accustomed for many years; It is normal". "In inMediaStudio we work with publishers for primary, secondary, and vocational training. In any sector, and even more if we talk about educational content, the institutions that certifies that content gets to be very valuable; therefore, working with Santillana, Anaya, or SM equals to say that you're working with the best 'brands' in content generation. As for eLearning, we have had several projects with private colleges, but they do not stop taking the plunge. In the end, developing an eLearning service that satisfies both who develops it and who consumes it has costs that, or are considered a part of your business or strategy, or you do not see them reasonable. In many cases, you are paying a lot of money for very powerful platforms, but very little to the development of content to be consumed digitally, so you are still limping a leg. You cannot say that you do eLearning if you are giving PDFs as support to your content". "We have been in the business for over 6 years and we have progressed little by little. Technology advances faster than you might expect. Innovations are arising from week to week and when you go to non-experts, or you show them these innovations with content, or it gets to be very difficult to explain them in words. For this reason we set this Showroom, to teach with content the emerging innovations". "In the digitization of content, you can do great things with small investments and go in small steps until the digital transformation is consolidated". "The sector is complicated. It’s being a long time been 'evangelists', to spread the benefits of new technologies. This year, it seems to be the launch of virtual reality. Since Facebook bought Oculus Rift for 2,000 million, the market began to take a different boost. Now other large companies such as PlayStation are launching their virtual reality devices to the market, which will make the general public to be able to access these devices and to start seeing the force that the virtual reality or augmented reality have.